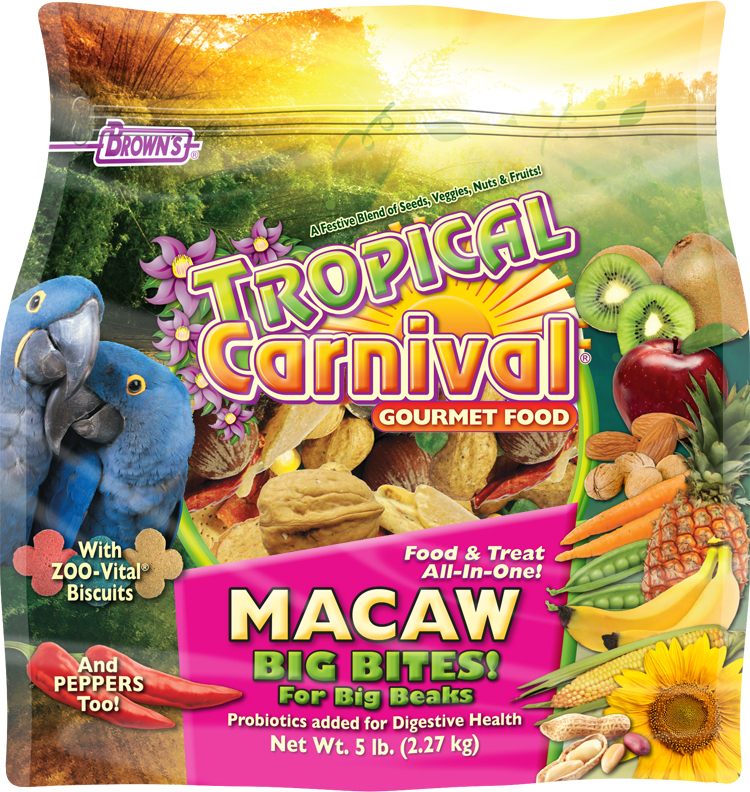 Tropical Carnival® “Big Bites for Big Beaks” Macaw Food is a vitamin-and-nutrient-fortified food and treat, all- in- one, providing an enticing and stimulating eating experience for your companion pet. Tropical Carnival® is jam-packed with a medley of delicacies to satisfy your pet’s hunger cravings, and it’s specifically formulated for large birds’ daily dietary needs. 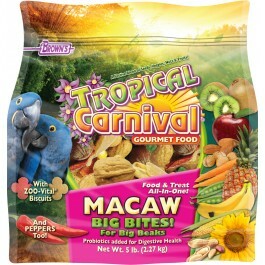 Tropical Carnival® “Big Bites for Big Beaks” Macaw Food is a vitamin-and-nutrient-fortified food and treat, all-in-one, providing an enticing and stimulating eating experience for your companion pet. Tropical Carnival® is jam-packed with a medley of delicacies to satisfy your pet’s hunger cravings, and it’s specifically formulated for large birds’ daily dietary needs. We’ve blended the finest ingredients, as well as beneficial bacteria to support healthy digestion. It all adds up to a great tasting, hearty, healthy food your pet bird will find simply irresistible! Tropical Carnival® has the “Big Bites" for big beaks that parrots love! It’s a balanced blend of big, chunky, crunchy, wholesome morsels of right-sized fruits, veggies, nuts, seeds, and grains, plus our twice-baked ZOO-Vital® Biscotti Biscuits. All the fun shapes, textures, varieties, sizes, and colors make this a stimulating diet that your macaw will love to eat. It’s simply irresistible! 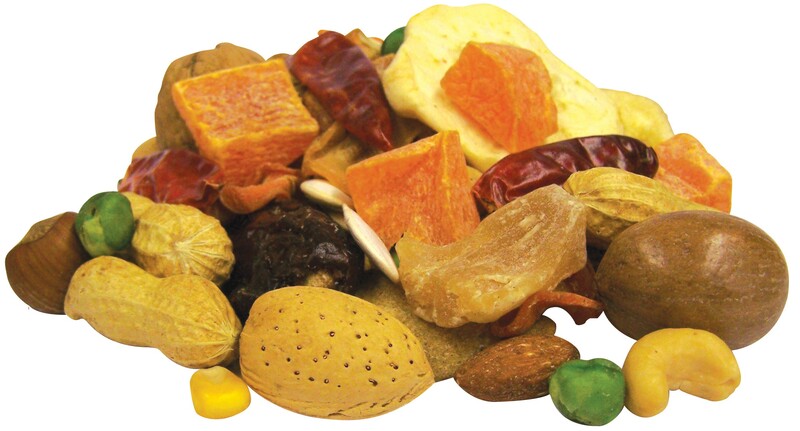 Striped Sunflower Seeds, Corn, Peanuts, Dried Banana, Mixed Feed Nuts, Dried Papaya, Dried Pineapple, Dried Dates, Dried Peas, Pumpkin Seeds, Dried Apricots, Dried Carrots, Dried Red Chili Peppers, Walnuts, Almonds, Dried Apple, Dried Kiwi, Filberts, Pecans, Wheat Flour, Ground Corn, Ground Oats, Corn Gluten Meal, Dehulled Soybean Meal, Soybean Oil (preserved with Mixed Tocopherols), Dicalcium Phosphate, Brewers Dried Yeast, Calcium Carbonate, Menhaden Fish Oil (Source of DHA & Omega-3 Fatty Acids), Fructooligosaccharide, L-Lysine, Salt, Vitamin A Supplement, Vitamin D3 Supplement, Vitamin E Supplement, L-Ascorbyl-2-Polyphosphate (Source of Vitamin C), Thiamine Mononitrate, d-Calcium Pantothenate, Vitamin B12 Supplement, Choline Chloride, Manganese Proteinate, Iron Proteinate, DL-Methionine, Zinc Proteinate, Sodium Selenite, Dried Pediococcus acidilactici Fermentation Product, Biotin, Folic Acid, Lecithin, Mixed Tocopherols (a preservative), Yucca Schidigera Extract, Rosemary Extract, Sugar, Beta-Carotene, Natural and Artificial Orange Flavor, Colors Added (Titanium Dioxide, Red 40, Blue 1, Yellow 5 and Yellow 6) and Sulfur Dioxide (a preservative).